A HBO spokesperson has confirmed that the group has re-commissioned the fantasy series, 'Game of Thrones' following audience figures of approximately 4.2.million in the US for its April 17th premiere broadcast and a peak UK and Irish figure of 823,000 on April 18th. The show opened to a gross US audience on the main HBO channel of 4.2 million viewers and it enjoyed the biggest opener in the UK and Ireland on Sky Atlantic since the channel’s launch. Where the latter is concerned, the show trumped Sky Atlantic's previous highest overnight audience, ‘Boardwalk Empire’, the premiere of which brought in 438,000 viewers. The US premiere broadcast of the show brought in 2.2 million viewers with a second showing bringing in a further audience of 1.2 million and another 800,000 for the third telecast bringing in the total of 4.2 million. A Sky Atlantic spokesperson has confirmed that the UK and Irish premiere of the series on Monday, April 18th brought in an average of 743,000 viewers, peaking at 823,000 audience members. As such the show enjoyed the biggest opener since the channel’s launch trumping the channel’s previous highest overnight audience, ‘Boardwalk Empire’, the premiere of which brought in 438,000 viewers. This figure does not include those who saw the premiere through other media platforms such as Sky+. The UK and Ireland premiere broadcast of the series took place a day after the show’s US premiere, the audience figures of which will be available later this week. The fantasy series, based on George R.R. Martin’s best-selling novels, shot in Belfast for six months in 2010. Penned by David Benioff (Troy) and D.B. Weiss (Kashmir) alongside Bryan Cogman (My Own Worst Enemy), Jane Espenson (Dollhouse) and George R.R. Martin (Beauty and the Beast), the series’ pilot saw King Richard Baratheon, played by Mark Addy (The Full Monty) and his wife, played by Lena Headey (300) of the wealthy and corrupt House of Lannister, ask Sean Bean’s Eddard ‘Ned’ Stark to become the king’s chief advisor after the questionable death of his right-hand man. The series was directed by Tim Van Patten (The Sopranos), Brian Kirk (Dexter) alongside Daniel Minahan (True Blood, Six Feet Under) and Alan Taylor (Mad Men). 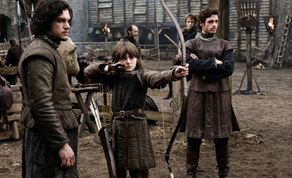 The show’s other cast members involved in the project include Alfie Allen (Atonement), Peter Dinklage (Elf); Nikolaj Coster-Waldau (Black Hawk Down) and Jerome Flynn (Soldier, Soldier) as well as Irish actors Aidan Gillen (The Wire); Jack Gleeson (Batman Begins), Stephen Don (Omagh) and Michelle Fairley (Best: His Mother’s Son). The pilot episode of ‘Game of Thrones’ will broadcast again on Sky Atlantic HD on Wednesday, April 20th at 10:10pm.